What on this Planet does a gold fish and an abundant life have in common? Well, sit in a calm place with a glass of your favorite wine or a cup of coffee and really think of your life. Close your eyes if necessary, play your favorite music and truly look deep inside you. Who’s life are you living? Can you even see yourself in your present life? Whose voice is louder? Yours or your mothers? Yours or your boss’s? Yours or your children’s, your husband’s, politics’, crisis’…Whose thoughts are creating your life? It can be shocking what you realize. But don’t worry! You are in safe hands here. If you are reading this, then you want to live better. You want to be in control of your own life. That’s the first, but important step. 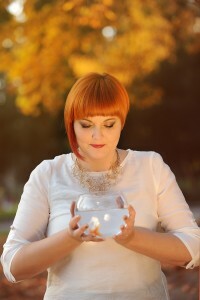 But, wouldn’t be easier to just ask my gold fish to fulfill those 3 wishes I have? Wouldn’t it be more safe that someone else could change my life with a magic stick? Wouldn’t it just be awesome to imagine a better life and wake in a different life in the morning? Yes, it would be. But how can anyone else know what desires burn your heart? What are the tops that you want to conquer in your life? What images are you playing on the screen of your mind? What if I told you that you already have a goldfish who can create a life you want to live? Play with that idea in your mind for a while. And think again. Who has the power? It’s YOU and ONLY YOU! How does it make you feel? Happy? Sad? Angry? Peaceful? Anyway, deep down you know I am right. Because you feel that life has to be more than it is at the moment. It can lead you to have better relationships, more fulfilling business or work, more money or just more free time to travel, enjoying the sunset with your lover, playing with your children, having dinner with your husband or just laying on the grass and pretending that you can fly. That’s why I call it a goldfish life. Because it’s not just a program or a seminar or maybe one “aha” moment, which changed your life for a while. It’s the way of everyday living. It’s a mind-set which affects all spheres of your life. I believe this is an abundant way of life. To feel free, calm, powerful and healthy – living a life you want to live. That’s success for me! You have nothing to lose if you try, you know? Decide NOW that the goldfish life is the ONLY WAY OF LIFE you want to live from now on. Because you DESERVE it!